Browsing Annalise Basso’s IMDb page t’other day alerted me to the existence of a short (NSFW) western joint called The Good Time Girls (2017), directed and co-written by Courtney Hoffman (with Lucy Teitler), who’s worked as a costume designer on numerous big-name movies, though the one that really leaps out here is Tarantino’s The Hateful Eight, since this flick shares a lot of its darkly-comedic-oater DNA. 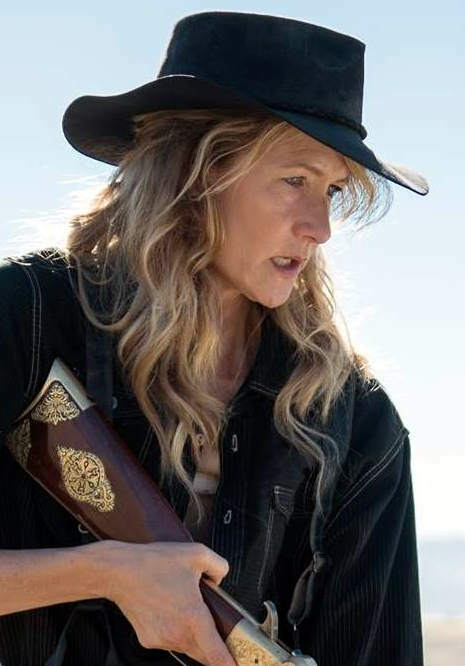 With such a brief running time it’s kinda hard to summarise the plot without spoiling it… suffice to say, Laura Dern stars as a woman taking revenge against the men who’ve wronged her, along with her cute-but-deadly accomplices, played by Basso and Alia Shawkat. It’s a well-crafted piece as it goes, and has been lauded by critics for its “radical feminist” credentials… however, I couldn’t shake the nagging sense that it seemed more like the climactic sequence from a much larger story, or a proof-of-concept demo, rather than a satisfying self-contained story in itself. Thankfully Hoffman and Teitler are currently working on a feature-length “remake”, which will hopefully deliver on the strong potential that they (and their characters) demonstrated here. This entry was posted in Rants about Films and tagged Alia Shawkat, Annalise Basso, Courtney Hoffman, Laura Dern, Lucy Teitler, The Good Time Girls, The Hateful Eight. Bookmark the permalink.